Monday was MLK Day (Dr Martin Luther King) in the US. It’s a national holiday that celebrates the achievement of one of the greatest men of the 20th Century. In 2010 at the American Embassy in central London, one of Dr Martin Luther King’s principle disciples - Rev Jesse Jackson - paid me, perhaps the biggest political and indeed, community compliment I have ever had: He told the packed audience, including the then new Ambassador Matthew Barzun, had I have been around back in the sixties in Black America, the great man - King - would have chosen me to be part of his team that changed the world. ‘Wow’ I thought at the time. But even before that immense compliment, I’d set my sights on delivering MLK’s dream for a British context. Of course, like him, our starting point with OBV, nearly 25 years ago, was voter registration. Like King, we; Lee Jasper, Derek Hinds, Ashok Viswanathan, Rita Patel, Dave Weaver and Audrey Adam’s recognized that without power - in this case political power - nothing changes. Nothing. I often tell the story when the then Shadow Home Secretary Jack Staw called our office to ask if he could announce at one of our first meetings, back in 1997, that if Black people voted Labour, then he would deliver a Public Inquiry into the murder of Stephen Lawrence. The power of the Black vote was being realised. But even more than King’s political empowerment programmed that we unashamedly copied - actually, our starting point, driven by Derek Hinds, also included Malcolm X, who famously said, we must use the ‘ballot, not the bullet’, I was utterly struck by King’s capacity to community organise, and politically lobby. His most brilliant book, Great strides forward, became my bible for political activism. 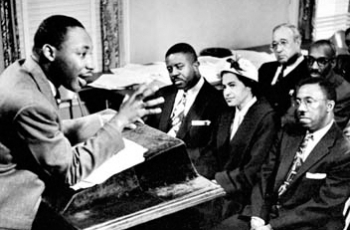 The book is his account of the phenomenal Montgomery Bus boycott, which today's students might mistakenly believe the bus boycott, was a boycott, like not wearing a brand of clothing or eating a particular make of food because they are ethically dubious. Nothing could be further from the truth. This campaign, which lasted for over a year, presented a hardship for tens of thousands of poor Black workers who depended on this transport to get to work to put food on their families table. It created an organisational team, not seen before or after the Montgomery boycott. It challenged the Black leadership, particularly the in the church, and challenged its very being, all this along with acts of betrayal that were jaw dropping. Above all, King and others put their lives along with the lives of their young families on the line. King’s house was fire bombed on one occasion, which shook up his family and reminded King what was at stake here. Reading this book though, I realised that King was not only a brilliant strategist, campaigner, but also a shrewd political lobbyist too. To eventually achieve success he would have to operate at optimum in all those areas. Whenever, I’m asked what books I would recommend to would be Black politicians or activists, I straight away jump to Kings' Great Stride Forward, the other book I recommend is A racial contract by Charles Mills, very different, but equally empowering and illuminating. So when I reflect upon MLK, his dream and his work, I quietly and proudly feel that like many thousands of individuals, I’ve taken King’s baton and run a leg that will get us closer to the finishing line of greater race equality. Am I a disciple of King? Well yes, if that’s not too arrogant a thing to say. Then definitely yes.